19 Dec, 1997, I believe there’s bunch of people crying inside a movie theater. It is the very day that Titanic, one of the most popular movies of all time, was introduced to us. It achieved critical and commercial success. Nominated for 14 Academy Awards, it tied All About Eve (1950) for the most Oscar nominations, and won 11. Soon it became the glare of publicity. The Story was about the love between a 17-year-old first-class passenger Rose DeWitt Bukater and a penniless artist, Jack Dawson. and finally the ship struck the iceberg and sank. From Today’s point of view, this story is quite cliché. However, has it ever come across your mind, that if there’s object avoidance, Titanic might have never sunk, and the famous movie would never come out and Leonardo would’ve never become famous? Obstacle avoidance is the task of satisfying some control objective subject to non-intersection or non-collision position constraints. In unmanned air vehicles, it is a hot topicţ. What is critical about obstacle avoidance concept in this area is the growing need of usage of unmanned aerial vehicles in urban areas for especially military applications where it can be very useful in city wars. Normally obstacle avoidance is considered to be distinct from path planning in that one is usually implemented as a reactive control law while the other involves the pre-computation of an obstacle-free path which a controller will then guide a robot along. There’re a lot of ways for Obstacle avoidance. and one way is to applicated with Lidar. As you know, there are a wide variety of applications for lidar, including Agriculture, Problem statement, Algorithm overview, Pre-processing, Feature extraction, Reflectance features and so on, but one of the most important application is Obstacle avoidance. This is used on most of the automatic devices, such as AGV, UAV, and even robot Vacuum. It’s very common to find these devices attached with Lidar. Take PRECASTER CA113 2D Scanner for example. This is a 2D lidar manufactured in Taiwan. 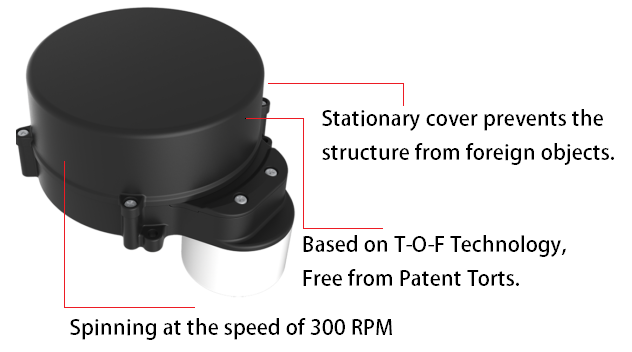 Based on T-O-F (Time of flight) technology, the sensor is able to tell distance from 360 degrees by calculating the time of the light flying from the Laser diode, hitting target and bouncing back to the the sensor. Deformation won’t affact the accuracy. Usually, a 2D lidar made by other manufacturer is based on Triangulation, this totally violates the patent of NEATO, the inventor of the Triangulation 2D lidar. Therefore, T-O-F technology makes Precaster CA113 2D Scanner free from patent tort. For more information, you could check on Precaster’s website or spec.